AT4AM: the XML web editor used by Members of European Parliament ‘Fhe new FSI Direcfif’: the missing teeth or as good as it gets? The legal profession has for long been notoriously averse to change, but now even the legal industry is affected by a new harsher reality with widespread changes impacting legal practice and client service. These changes come not merely from the aftermath of the economic downturn with price pressure and increased demands from clients, but also from the technological developments and regulatory changes that provide breeding ground for new kinds of competition. This post discusses the future of legal service, with a specific focus on how the current changes on the legal market demand a more strategic approach to knowledge management and efficient working processes and how technology is becoming more and more important as a way to develop new innovative ways to deliver legal services. But now, there are strong drivers for change affecting the legal market and rapidly forcing it out of the “black box” towards a new reality. One such driver is the regulatory changes in UK, with the Legal Services Act allowing different types of lawyer and non-lawyer to form businesses together, thereby facilitating the development of Alternative Business Structures, with external investments, in legal service providers. These regulatory changes have opened up the legal market for a new kind of competition from new entrants with disruptive business models. Unlike conventional law firms, these new providers tend to have a greater focus on rethinking legal services. They have developed both different kinds of legal services and new ways of providing them. They use technology to improve the way they connect to clients, offering new and easier ways to conduct legal tasks over the Internet, providing cloud-based customized legal documents and advice with arguments like “No surprise pricing. No hourly fees, no shocking bills.” This is a market that has gained a large interest from venture capitalists, for example by Google Venture in Rocket Lawyer (which recently also acquired competitor Law Pivot), Kleiner Perkins and Institutional Venture Partners in LegalZoom and Quotidian Ventures and others in Docracy. All this clearly indicates that there is a large market opportunity for these kinds of new legal solutions that are efficient, technology-driven and affordable to users. Other interesting new legal service or knowledge providers are VentureDocs, Docstoc and the Swedish Moretime Growth On Demand. Soon, we will probably also see global legal service providers outside the legal sphere, such as department stores or investment banks, accounting firms, insurance companies, or even Amazon. Law firms also face a new kind of competition from Legal Process Outsourcing providers (LPOs), where legal work is exported to an outside law firm or legal support services company, often in low-wage markets overseas such as India, but also to new providers within the same country or to new brands established by the law firm itself, such as Herbert Smith’s document review centre in Belfast. The most commonly offered services are document review and legal research, but recently LPOs have started to move up the value chain by providing not only due diligence services but also the agreement drafting in M&A transactions. As reported in “LPOs Stealing Deal Work from Law Firms” alternative legal service providers are beginning to take the bread-and-butter of large law firms – handling whole mergers and acquisitions, not just the due diligence aspects of deals. Beyond cost savings, LPO has advantages like access to outside talent, 24-7 availability, and the ability to quickly scale up or cut back operations. According to the international LPO Market Study, general counsel are increasingly bypassing law firms and instructing legal process outsourcing suppliers directly. Currently worth over $1bn (£629m), the LPO market is forecast to double in size in the next two to three years. 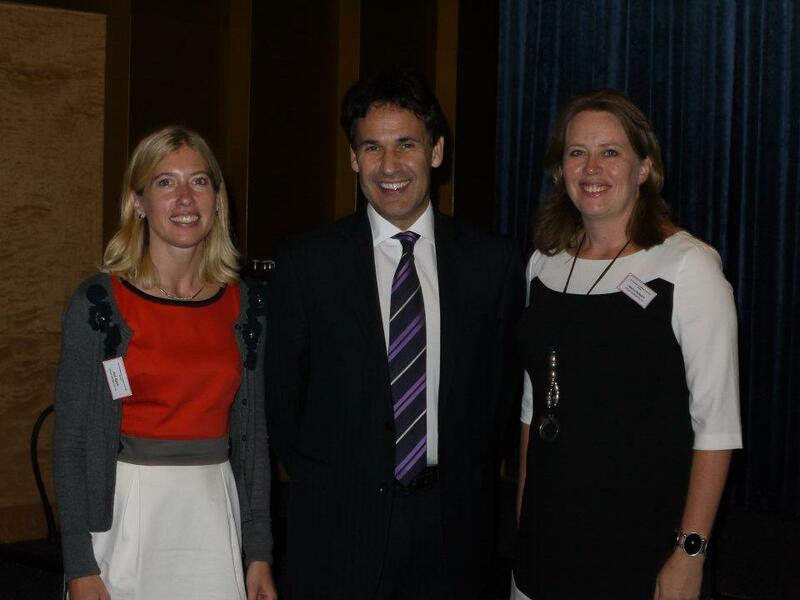 Professor Richard Susskind with VQ Founders Ann Björk and Helena Hallgarn at VQ Forum. 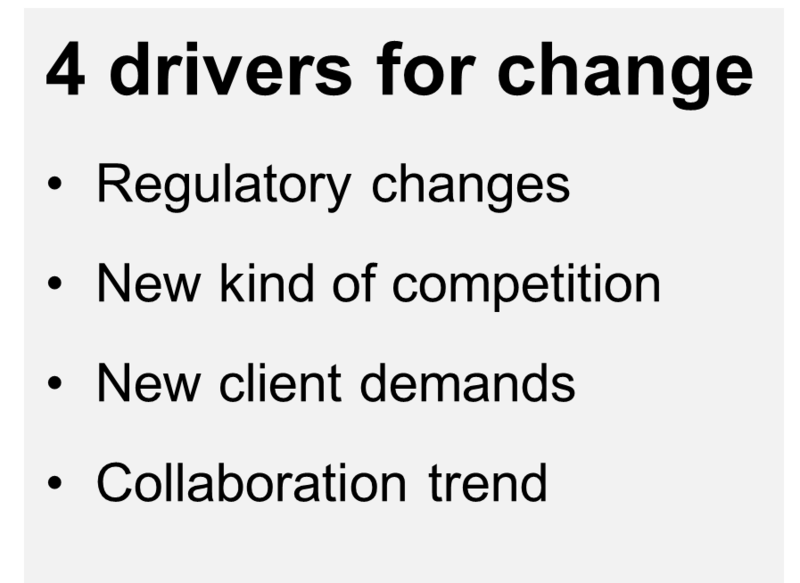 A third major driver for change is the new client demands. Due to budget restraints, most general counsel face what Professor Richard Susskind refers to as the “more for less-challenge”, when clients have more legal issues to handle, but less in-house resources and less budget to spend on external advisers. This challenge has forced general counsel to examine alternative solutions, demand discounts and alternative fee arrangements, ask for predictability and metrics–all demands for added value and efficiency. When law firms are no longer the only providers in the legal market, clients have a diverse set of options to choose from for legal advice and they no longer accept hourly billing for inefficient work. 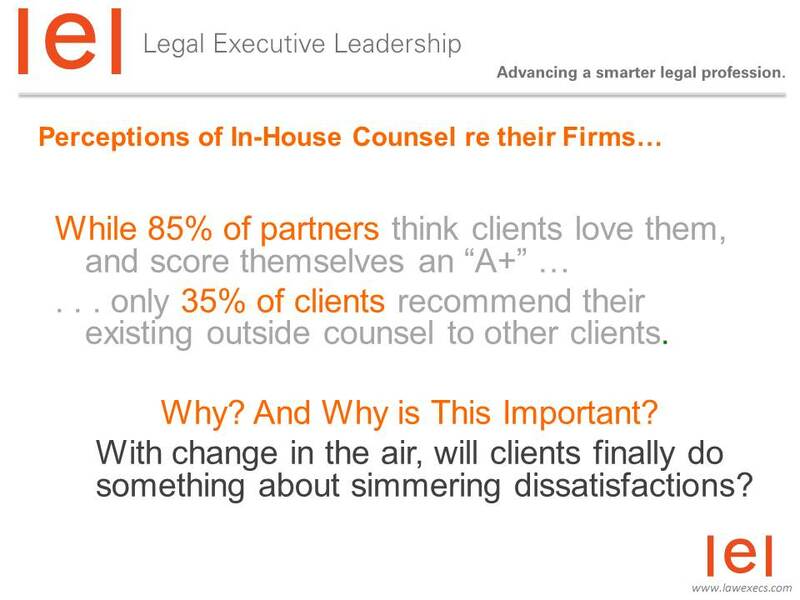 General counsel are more closely reviewing external advisers and are very cost driven. More and more they turn to cost-effective solutions, like LPOs, or deploy the idea of “multi-sourcing” with the use of different legal service providers on different elements of a legal matter. Basically, the client has taken over the driver’s seat from law firms and is now dictating cost, pricing, staffing and strategic direction, which previously was in the law firm’s control. Together, these two factors — a decline in overall legal spending and new options for legal services — combine to reduce demand for the services of lawyers. An interesting new initiative to pinpoint law firms’ inefficiency has been made by D. Casey Flaherty, who has developed a basic technology competency audit that he administers to his outside counsel to show how the lack of proficiency with the common software tools at their disposal (Word, Excel, Acrobat, etc.) result in an inordinate amount of time wasted that is still billed to clients. 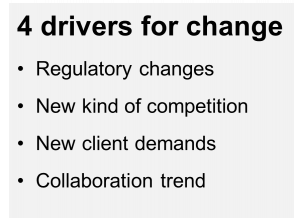 The fourth major driver for change on the legal market is the collaboration trend. Today’s business conditions has completely changed with the so-called ”sharing economy” and the new generation of ”Millenials”, as defined by inter alia futurist Michael Rogers. Michael Rogers talks about the future of the legal industry as an era inspired by the Millenials; those who do not consider themselves limited to meeting people in their neighborhood but instead create relationships with people all around the world, based on interests instead of locality. In this era, new business is gained through referrals and by creating relationships through social technologies, collaboration and providing information for free. This ”freemium” trend has also been noted for legal professionals in the American Bar Association’s Legal Technology Survey Report, where 56% of the respondents use a free online source for their legal research. Clients are becoming more and more aware of the collaboration advantage. There are more and more legal collaboration portals available, such as the Association of Corporate Counsel that provides templates and other legal documents to its members, and Legal OnRamp, a collaboration system for in-house counsel and invited outside lawyers and third party service providers. Another interesting collaboration example is Pfizer Legal Alliance, a collaboration program for Pfizer’s outside counsel, which makes them work more closely and collaboratively both with Pfizer and with each other using standardized fixed-fee billing arrangements. Richard Susskind also talks about the “collaboration strategy” for law firms, where clients can come together and share the costs of certain types of legal service, as well as collaboration projects between law firms and clients, by online closed communities for collaboration, online legal services, automated drafting and electronic legal marketplaces. Although some lawyers might find this controversial, such collaboration has already started to take place: six major banks and the law firm Allen & Overyhave created a joint online legal risk management tool. Analysing what is happening on the legal market with the new trends with LPOs, new legal service providers, virtual law firms and the increased collaboration and knowledge sharing within legal networks, you can see that clients are becoming more and more aware of new tools and processes and will start demanding their lawyers to adapt to the new technology to become more efficient. Law firms, therefore, have to review the value of their services and the use of technology to streamline processes and take better advantage of a firm’s accumulated knowledge to ensure better service than their competitors. For the first time in legal history, there is now a true incentive for law firms to deliver results faster, through the right combination of internal and external resources and the better use of IT as a competitive edge. This means that law firms have to take a new strategic approach to knowledge management as a business development tool, a way of delivering the changes and innovation that will help law firms to survive and thrive in today’s dynamic and uncertain business and professional landscape. Furthermore, clients are no longer depending upon their law firms to receive standardized legal documents, since there are several sites with online legal documents easily available, often for free, as well as collaboration portals. Law firms have lost control over the legal documents they earlier considered the “crown jewels” of the firm. It also means that demanding and skilled clients, like in-house counsels, have easy access to more affordable legal resources and are becoming less willing to pay high fees for some of the work done by junior associates. Law firms, therefore, have to rethink their view of these legal documents and realize they are only the basis for their legal service and are already easy available for the clients. Instead, they have to look closer at how to better share knowledge from their experience, better re-use documents they have developed, standardize more routine work, and to analyse their most valuable knowledge in order to leverage it to fully support their clients. What is really interesting today is that not only legal KM professionals sees this “Holy Grail of legal KM” that Ron Friedmann refers to, but also recent developments in the legal publishing world prove that legal publishers are on the same path; e.g. Rocket Lawyers acquisition of LawPivot and Thomson Reuters’ launch of client-centric platforms. Thus both legal KM professionals and legal publishers seem to agree that it is not enough to provide information, work products or precedents. Instead, focus is on supporting lawyers to improve the way they work and serve clients, and ultimately to improve how law firms operate as businesses. In “Is KM a Real Force Multiplier?” Mary Abraham explained how KM needs to improve productivity and problem solving and how “the key to force multiplications is not to settle for incremental improvements but to aim for dramatically improved results”. With such a new focus, the Holy Grail of legal knowledge management appears to be within reach — where the goal of KM is to provide true competitive advantage by developing a combination of tools and content to improve lawyer productivity, solve real problems and make the business more profitable. By using IT in the right way, the possibilities of finding relevant information will be substantially improved and the internal knowledge sharing will be leveraged, since previous lessons learned, best practices and new ways of solving problems can be better shared and taken advantage of by all lawyers. Through these methods, substantial efficiency improvements and increased profitability can be reached. Developments in information technology will enhance the efficiency of legal work, not only by the use of standard documents like templates and checklists, but also by proceduralized processes and automated workflows. Systematization can also extend, however, to the actual drafting of documents by the use of document assembly technology. By implementing automated document production to support standardization, firms will be able to deliver the same quality legal services and still maintain profit margins regardless of fee structure. With a new approach to knowledge management as a management issue for the whole business, with embraced technology and new approaches to standardization by using document assembly tools and buying basic documents externally, substantial improvements in efficiency and increased profitability can be reached. 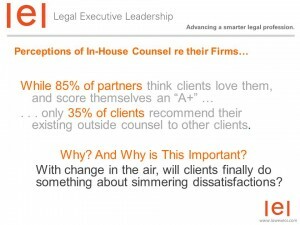 Law firms will prosper by finding new legal services to offer their clients. New business opportunities will arise in the provision of services to fixed prices by the use of new specialized and individualized solutions for clients. Helena Hallgarn and Ann Björk are founders of Virtual Intelligence VQ, a Swedish consultancy firm that combines the practice of law with IT and knowledge management skills. They are two of the most experienced knowledge management professionals in Scandinavia, with backgrounds from legal practice and KM work at Scandinavian law firms Vinge, Mannheimer Swartling and Gernandt & Danielsson. Their focus is to strategically develop legal KM and drive innovation in the legal profession. Helena and Ann blog at Legal Innovation Blog and manage the LinkedIn-discussion group Legal Innovation. Each year they also arrange VQ Forum with a focus on the most interesting ongoing discussions worldwide on strategy, leadership, innovation, technology and knowledge management for the legal sector. Helena and Ann can also be found as @VQab on Twitter. I completely agree with your above 4 drivers for changes and develop the legal knowledge management. Great article, agree with Cloud based solutions making a real impact. Good to see firms starting to see the potential these systems can offer. The regulatory issue and professional negligence law are often overlooked as key factors in the change matrix. Research suggest that many clients want unbundled legal advice and services. The days are gone when a client simply hands over a matter and case and allows the lawyer to just do the best job and the fee then gets determined, perhaps with no proportionate connection with the value or risk to the client. Clients simply don’t look at it that way. The problem for the lawyer, under UK law, is that accepting a task which doesn’t cover all the bases for the client, at a reduced fee, leaves the lawyer wide open under negligence law, which simply doesn’t recognise, at the moment, then reality of a limited scope retainer, where the client retains some of the risk and can only expect the lawyer to do what the client has agreed to [ay for. This is a huge issue, and unless it is solved, problems will ennure, many firms will go bust as miss out on huge untapped sme market, others will cut corners, and the system will not be efficient. A division bench of Delhi High Court in J B Exports Ltd and another vs. BSES Rajdhani Power Ltd (2006 134 Comp cas 106 Del. decided on 03.03.2006) observed that “the concept that a company is a distinct legal entity apart from its shareholders, vide Salomon vs. Salomon & Co. (1897 AC 22 HL) had a historical purpose. Its main purpose was to encourage entrepreneurs to start new business ventures and, thus, help in the process of industrialisation.” This background is so important that it merits consideration in detail as follows. The administrative issue and expert carelessness law are frequently ignored as key elements in the change network. Research propose that numerous customers need unbundled lawful exhortation and administrations. The days are gone when a customer basically hands over a matter and case and permits the legal counselor to simply do the best employment and the charge then gets decided, maybe with no proportionate association with the worth or danger to the customer. Customers just don’t take a gander at it that way.